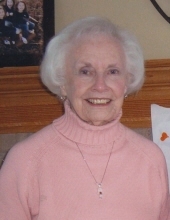 Eleanor F. Dejeski, age 96, of Burlington, passed away Thursday, April 4, 2019 at Pine Brook Pointe. Born in Chicago, Illinois on January 10, 1923, she was the daughter of Chester and Ruth (nee Wilson) Dejeski. She spent her early life in Chicago and Des Plaines where she graduated from Our Lady of Grace Grammar School, Holy Family Academy High School and the Illinois School of Business. Eleanor worked as a bookkeeper for the Utilities Engineering Institute and Tam-O-Shanter Country Club. She moved to Wisconsin in 1989 and was a member of St. Mary Catholic Church. She traveled the world extensively from 1951 to 2004 and enjoyed spending time with her nieces and nephews. Eleanor is survived by her sister, Patricia (Edmund) Impens; nieces and nephews, Allison (Steve) Seno-Trytten, Gary (Kay) Seno, Cynthia (Dave) Seno-Peterson, Melissa Impens, Christopher Impens, Paula (Michael) Impens-Antlfinger and Craig (Lisa) Impens; and grand-nieces and nephews, Joseph, Caitlin (Alexej), Claudia, Olivia, Emma, Grace, Tai and Chase. She was preceded in death by her parents and sister Ruth (Sebastian) Seno. The family would like to thank Kindred Care Hospice and the staff at Pine Brook Pointe for their tender loving care and concern of Eleanor during this time. Memorial contributions may be made to Catholic Central High School. A Mass of Christian Burial will take place on Tuesday, April 9, 2019 at 12 noon at St. Mary Immaculate Conception Catholic Church. Relatives and friends may visit with the family on Tuesday, April 9th in Good Shepherds Chapel from 11:00 AM until 11:45 AM. Eleanor will be laid to rest in St. Mary Cemetery following Mass. To send flowers or a remembrance gift to the family of Eleanor F. Dejeski, please visit our Tribute Store. "Email Address" would like to share the life celebration of Eleanor F. Dejeski. Click on the "link" to go to share a favorite memory or leave a condolence message for the family.